Mysore pak (Kannada: ಮೈಸೂರು ಪಾಕ) originally called as Mysuru Paaka (Paaka means a sweet syrup) is an Indian sweet prepared in ghee that is popular in Southern India. It originated in Mysore in the Indian state of Karnataka. It is made of generous amounts of ghee, sugar, gram flour, and often cardamom. The texture of this sweet is similar to fudge. Mysore pak was first prepared in the kitchens of the Mysore Palace during the regime of Krishna Raja Wadiyar IV, by a palace cook named Kakasura Madappa. Madappa made a concoction of gram flour, ghee and sugar. When asked its name, Madappa had nothing in mind, simply called it the 'Mysuru paka'. Pak (or paka, more precisely) in Kannada means sweet. It is traditionally served in weddings and other festivals of southern India, and is very popular in baby showers as well. Paaka shastra (short paka) in Kannada means 'cooking procedure' or 'cooking techniques'. 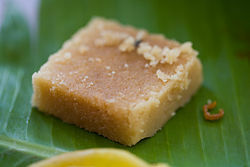 Also paka in Kannada refers to sticky sugar syrup obtained by simmering sugar with equal amount of water; specifically for Mysore Pak, the simple syrup is heated to the soft ball stage. The syrup is used as the primary sweetening agent in various Indian sweet dishes like Jalebi, Badam puri, Mysore pak and others. The syrup is flavored with various spice essences like cardamom, rose, honey etc. Paka syrup preparation is a skilled art mastered by few cooks, some of whom keep their methods secret. Shape: Mysore pak is cut into squares or rectangles. Texture: Hard and porous when made with less ghee, soft and dense when made with generous amount of ghee. Moisture from the sugar syrup escapes as steam through the greased gram-flour rendering Mysore pak porous. Excess ghee, if any, may fill in such pores rendering it dense. Colour: Yellow to light brown due to gram flour (roasted). Shelf life: Very little water is used in the preparation, so it can stay fresh in cool and dry place, but it should be used within one month only. ^ a b c "Is Mysore Pak anti-national?". ^ a b Mujumdar, Neha (24 November 2012). "In search of Mysore Pak" – via www.thehindu.com. ^ Yashaswini S. N. (6 August 2012). "Mysore's own pak, a piece of royalty that melts". The Times of India. Retrieved 23 October 2015. Wikimedia Commons has media related to Mysore pak.